The second half of the 20th century has seen the emergence of semiconductor quantum structures driven by promises of far superior performances in particular regarding light emission. The dimensionality was reduced down to point-like quantum dots (QDs). QDs exhibit intriguing similarities with atoms and tremendous efforts were made to assess their properties. 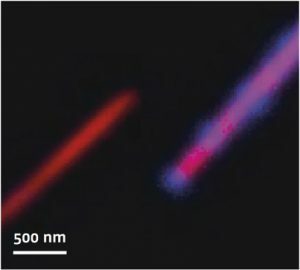 The growth of quantum dots embedded in filamentary crystals, known as nanowires (NWs), become relevant given the strong interaction between light and NWs. Quantum dots in NWs are particular expected to be key elements in quantum technologies, such as quantum communications and cryptography. However, the reduced dimensionality of both QDs (ar. 5–10 nm) and NWs (ar. 100–200 nm in diameter) can strongly complicates the measurements of the quantum dots properties. In particular, absolute QDs position and resolution between closely lying dots is hard to assess with full-optical measurement due to diffraction limitations. The large numerical aperture ensures a very high signal-to-noise ratio, leading to a shorter exposure of the quantum dots to the electron beam and hence reducing the risk of bleaching as well as speeding up the experiment. 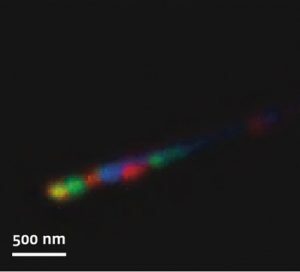 The higher signal allows to use straightforwardly a spectrometer-CCD detection channel, without the need of photomultiplier tube, yielding directly fast hyper-spectral mapping. The wide emission spectral range is then captured (in our case from 650 nm to 900 nm). The spatial resolution permits to resolve closely lying dots as well as local features such as changes in the matrix crystal phase.